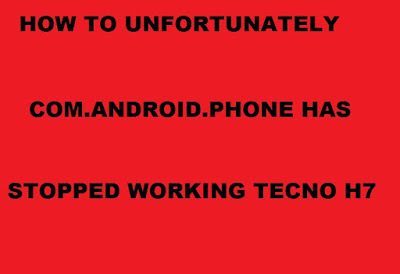 In this post, i will be showing how to fix unfortunately com.android.phone has stopped working Tecno H7 when picking calls. I first discover this problem with a friend phone when he brought the phone to my shop for fixing. I try multiply solution but such as factory reset, wipe userdata but all fail. so i though of reloading the phone and the problem was solved. I will be showing step to take on how to resolved the problem. What the cause of the problem. there are few things that are responsible for the problem of unfortunately com.android.phone has stopped working Tecno H7. The only solution to the problem of unfortunately com.android.phone has stopped working is the complete reload of the android os. Below is the requirement for reloading tecno H7. This guide is for those that are new to flashing of MTK phone.